It’s been ten years (or will be on December 21) since Phantasy Star Online was first released. 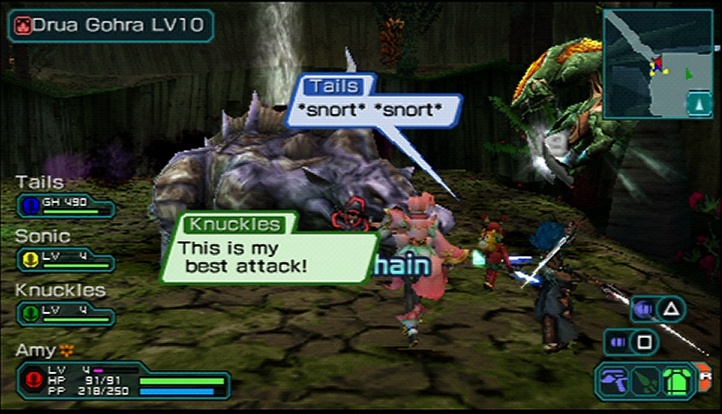 Since then, it has spawned various incarnations, including Phantasy Star Portable. Much to the chagrin of many, PSP1 lacked infrastructure support, and the DLC for it never made it way outside of Japan. Nonetheless, it was still a solid action RPG and for those that either had local friends who also owned the game or managed to get Xlink Kai or Ad Hoc Party running, it was a fun way to kill time running through dungeons slaughtering monsters with other people. 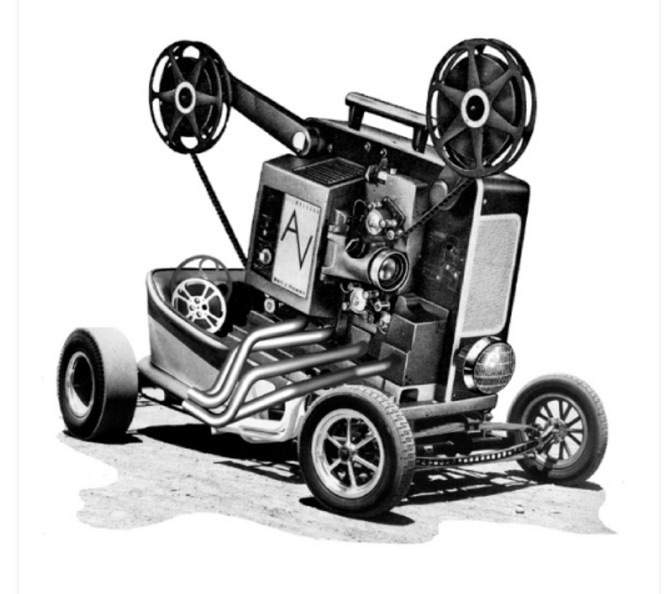 Did the sequel improve the experience, or does it fall flat, even with infrastructure support? 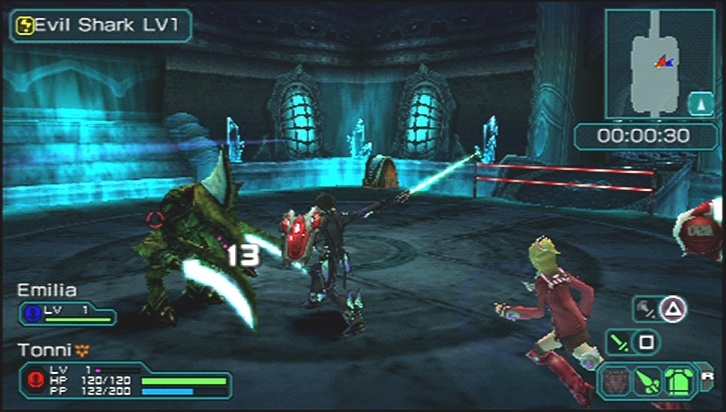 Phantasy Star Portable 2 takes place three years after the first game, though you don’t need to have played the first game to follow the events of this game. Due to Gurhal’s dwindling resources, a theory of subspace travel is developed, which enables people to migrate into space colonies. You start off as a freelancer trying to find work. A chance encounter with a girl named Emilia Percival leads to you becoming a member of the mercenary group she’s a member of, Little Wing, and for you to be partnered up with her. Though the course of the game you’ll find there’s more to your partner than first meets the eye, and that the corporation behind the research on subspace travel isn’t so innocuous. In addition, problems from three years ago rear their heads again. The story is decent and keeps things moving, but ultimately it’s not something you’d play the game for. At times, a dialogue option comes up and there’s only one choice to choose from, which is a bit silly, but at least that doesn’t slow things down much. Infrastructure support has been added, so now you’re not limited to ad hoc or fiddling with Ad Hoc Party or Xlink Kai for multiplayer. 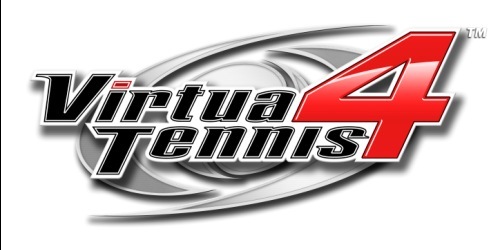 However, it lacks Phantasy Star Online‘s visual lobbies. Instead, you view a list of twenty random rooms at a time, and to view others you have to back out and then go back in to refresh the list. You can password lock a room, set a minimum and maximum level, and set the kind of missions for the room. Note that the latter two are not set in stone but rather simply help you find those with similar goals. It’s also not too hard to find others to play with – whenever I’ve created a room it fills quickly. If you have a UMD version, you have to enter a code to get online via the PSN, though at the moment it seems to be letting people on even if they didn’t register the code, though I’m sure that won’t last forever. The only in-game communication option you have is the onscreen keyboard, and it’s arranged in ABC format rather than QWERTY. It’s alright for short messages, but it’s so slow to type on prolonged conversations prove onerous. To make communication a bit easier, you can set auto words, which trigger automatically under certain circumstances (like being healed), and quick messages, which is a list of messages you can scroll through and select to have it pop up instead of sitting there typing it out every time. There are also battle missions, wherein you can fight against other players, either in teams or in a free-for-all. There’s a capture-the-flag style mission involving capturing energy poles and the opposing team’s base, deathmatch, gathering as much meseta as you can and killing other players for theirs, and others of that ilk. 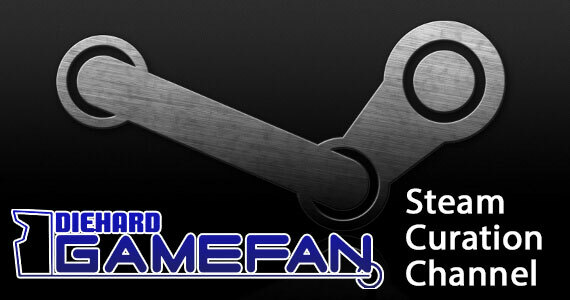 Whether you emerge victorious or defeated, you earn points towards your battle rank. It’s a fine diversion if you’re bored of running other types of missions, and it sets everyone on equal ground by reverting everyone to level one and giving them all the same equipment. However, lag saps some of the fun out of it, and it doesn’t seem to be a popular choice, as the only way I could play them was to make a room myself and select them. 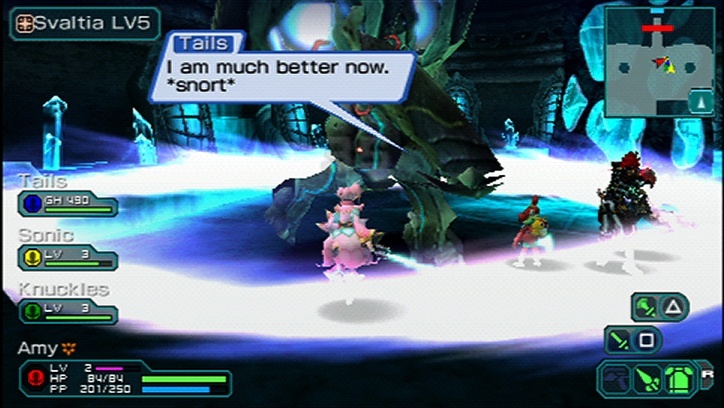 Tactical missions have specific goals, such as clearing a dungeon in a certain time. Challenge missions are online only, require at least two players, and come with fixed character and type levels, as well as limits on item usage. You can play local multiplayer mode alone if you’re feeling antisocial or can’t get your PSP online, though you still need to have your WLAN switch on, and the missions will be more challenging to tackle on your own. Some multiplayer missions will require another human player (namely ones with switches that require people to stand on them simultaneously), as you can’t take partner characters with you. 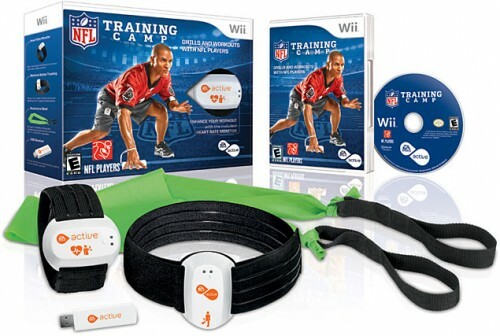 However, it is a good source for experience if you need to gain levels quickly. The game looks pretty good overall. The surroundings are fairly detailed and generally brightly colored. You have a bevy of options in terms of changing your character’s appearance, and you can keep changing your appearance as long as you have the meseta to shell out for it, though changing your character’s build costs a ridiculous amount of meseta. The cutscenes are nice to look at, but never last too long. The boss introductions make them look fairly intimidating – at least until you defeat it. If you’re playing from the UMD, there’s sometimes a lag when switching weapons, both on and offline. Playing online in general is not entirely lag free, as you may sometimes see people warping around or swinging at nothing initially, but it does work well enough (though of course the type of connection you have also plays a role). The opening song is your typical upbeat J-Pop fare, though it does have the effect of pumping you up whenever you start up the game. The rest of the soundtrack is decent, though there isn’t really one track that stands out. There are remixes of the forest and cave themes from the first Phantasy Star Online, which are fine in their own right but don’t surpass the original versions. 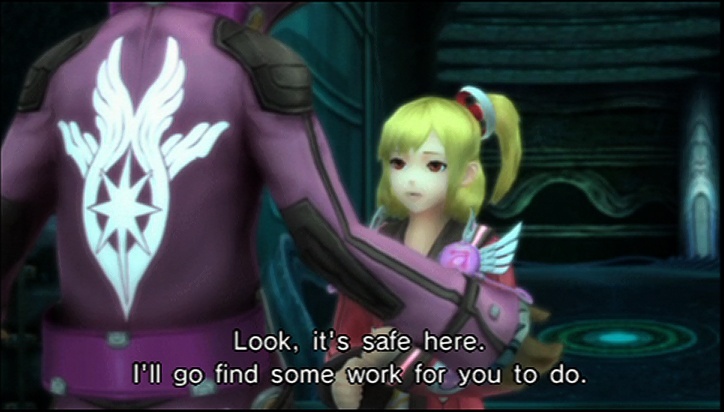 There’s less voice acting this time around, as it’s only present in the (short) cutscenes. Considering the quality of some of it, you’ll probably be thankful for that, but at the same time the lack of voice acting is puzzling considering the first game was fully voiced. Some of it is alright, but Emilia’s voice in particular can be grating since you hear it so much. One character has a very obviously fake and exaggerated French accent and peppers snippets of French throughout her speech, which can be either charming or annoying. The advanced classes (or types, as they’re known in this game) in the first game do not return. Instead, there’s just four types and four races. Hunters are your melee specialists and can use level 30 Photon Arts Skills. Rangers excel with ranged weapons like guns and bows and can use Level 30 Bullet Photon Arts. Forces specialize in technics (this game’s version of magic) and are able to handle level 30 technics. Vanguard is a new type and shares similarities with the first game’s Acromaster and Phantasy Star Universe‘s Acrotecher and Acrofighter. They’re balanced stat and ability wise, can use both EX traps, and have the highest evasion stat of all the classes. However, in any one area, another class does it better: hunters reign supreme in melee, rangers range, and forces technics. In terms of races, you have humans, who are overall balanced; newmans, whose stats lean towards technic use; CASTs, who are fairly sturdy and have high accuracy; and finally beasts, who are the physical powerhouses. Each type has its own level (which caps at 30), and you can change between them at your leisure. You will want to level up other types to crib their abilities. However, the race and gender you select at the beginning are fixed. Each ability costs a certain amount of points to eqiup, and how many points you have depends on your current level. The game provides a lot of room for exploration in terms of customization. Any extend points put towards ranking up a weapon can be taken back and put into another weapon, so you can shuffle around what weapons you’d prefer to specialize in. Photon Arts and Technics can be returned to disc to make room for others. You no longer level up individual skills, but instead find different level disks. This eliminates the need to spam a certain skill umpteen times, but it can be annoying trying to find a higher level disc of a skill you need. You can even take an early weapon and upgrade it to the point it becomes equal to an S rank weapon if you want to keep it for aesthetics. All weapons have a random element percentage, and deal more damage to enemies of the opposing element and less to those of the same element. Each element has an opposite – fire opposes ice, lightning opposes earth, and light opposes dark. You can set up to six different weapon setups in the action palette and switch between them by holding down circle and scrolling through them with the d-pad. With melee and ranged weapons, square inflicts regular attacks, which builds chains (a holdover from Phantasy Star Zero), while triangle unleashes a Photon Art, which is a more powerful attack but breaks chains. The higher the chain, the more damage you do with a Photon Art. With rods and wands, techs are set to the triangle and square buttons, with rods able to have four (the other two being accessible by holding down the right trigger) while wands can have two. You can also chain with offensive spells not set to the triangle button. The dodge roll, another feature from Phantasy Star Zero, appears here as well, and you’ll likely be using it a lot. There’s also Perfect Attacks and Perfect Blocks. Perfect Attacks occur whenever you press the square or triangle button at the same time as the ring around the respective button icon shrinks to the same size as it, and they deal critical damage. Perfect Blocks are executed by timing your blocks right when the enemy attacks, and damage incurred is reduced to zero. If you have a shield equipped, it will reflect the attack back at the enemy and inflict damage depending on its attack stat. The rolling and blocking maneuvers may draw comparisons to the Monster Hunter games, though aside from those similarities, they still play differently. There are three different endings, which are mostly affected by how you treat Emilia and how well you do on missions. Earning each one yields you a different wing visual module, which provides some incentive to go back and unlock them all once you’ve gotten through story mode. The fact that you can go back to any mission at your leisure once you finish the game makes that task easier to accomplish. There’s also a lot of missions outside of the story ones, and you can build up every type on one character if you so wished, so you won’t be running out of things to do anytime soon. Naturally, online play adds a ton of replay value, and not having to tinker with third party software for nonlocal multiplayer makes it more accessible to more people. Of course, said third party software is still an option if that’s what you prefer. Monsters’ levels scale with your own to an extent, so it’s harder to just powerlevel and steamroll them. With enough leveling, you could do that, but it’d take longer to reach that point. Any type/race combination is doable, though some will take more work than others, and the balance seems stacked against forces. Offensive techs aren’t as effective damage wise, and forces will have to rely on melee when their PP runs low, which is made more difficult by their mediocre defenses (especially newman forces). They’re still viable, and buffs/debuffs (and Resta, for obvious reasons) are still useful, but they’re late bloomers and take work to get there. The fact that you can freely switch and level up types does help mitigate that, as it allows you to swap in abilities from other types. Photon Points (PP) are not tied to a weapon, but rather your character, and it recovers faster when you land an attack, so all types will have to use melee to an extent. Anyone hoping to set up shop trading rare items will be disappointed, as you can only trade items that are B rank and lower, and you cannot trade spells or skills. While this cuts down on duped rare items being distributed far and wide, it also essentially makes trading worthless, as anything you could trade you could likely find easily on your own. The AI controlled partner characters have an odd habit of casting Resta after you cast it, even when you’ve issued the “heal” order. However, they do respectably during battles. There have been multiple iterations of Phantasy Star Online games, with another one on the way in the form of an expansion for this game (Phantasy Star Portable 2 Infinity). While there have been a number of tuneups to the mechanics, the core gameplay hasn’t changed much between them. While that’s not necessarily a bad thing, it doesn’t do much for originality. The announcement of Infinity falling in close proximity with the US release of PSP2 took some of the wind out of the anticipation sails for PSP2. That being said, the very fact that the series continues to get sequels and expansions indicates that people are continuing to buy it, and judging by how busy online multiplayer seems, the Infinity announcement doesn’t seem to have dampened sales of PSP2 too much. The game hooked me quickly, and I could easily spend hours going through missions trying to find better equipment and gain levels, as well as fulfill client orders. The tweaks in the gameplay all the more enjoyable, and I really like the flexibility the type system in this game affords abilities and weapons wise. Playing with other people is fun, and I sometimes found myself reminiscing about my time playing PSO. However, communicating is a bit difficult with the clunky onscreen keyboard, especially in the heat of battle, though without voice chat support you at least don’t have to deal with someone screaming in your ear about one thing or another. A little keyboard plugin, similar to the one for the PS3 controller, would help, though it’s doubtful such a peripheral would be released. Thankfully, online play is manageable even with the communication issues. Being able to decorate your room brought out the inner interior decorator in me. While a save file from this game unlocked content in Valkyria Chronicles II, the connectivity between the two games seems to go only one way and doesn’t favor this game. Thus far, any extra content has been distributed though vision phone codes, and thus far the only item from VCII to appear in this game is an Edelweiss model room decoration. The officially released codes can be found here. The items are fun extras (and in some cases useful gear), and there’s a bunch of gear people familiar with the series they’re derived from would recognize. As of this writing, it’s uncertain whether any of the DLC will be officially released outside of Japan; hopefully, it will be. If all else fails, there is a workaround to get the Japanese DLC working on US and European versions (a guide can be found here), though naturally the mission text will still be in Japanese. 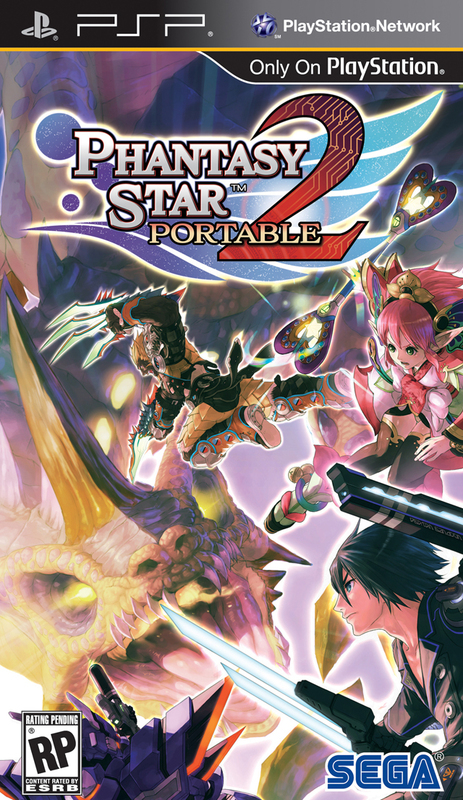 Phantasy Star Portable 2 is a rather enjoyable action RPG, whether you’re playing with other people or by yourself. The addition of infrastructure support facilitates the former, and while the plot is nothing special there’s a ton to do even long after you beat story mode. There’s a good deal of customizability both aesthetically and type/weapon proficiency wise. It’s got plenty of content and is well worth owning. I can definitely see myself booting this up for some missions runs, both on and offline, for quite some time. Now my PSP is hungry for PSP. And how often does one get to write a sentence like that? Guess this and Valkyria Chronicles II are going on my definite want list. I enjoyed the first PSP, but I’ll enjoy it even better being able to play it online. Samu – Yes, feed your PSP some PSP, hehe. Ashe – Yeah, between this and VCII, my PSP’s been seeing a lot of action. And yeah, the online support was a much needed addition (why the first one didn’t have it boggles the mind).